The silent caravan of the #marchanacional (national march) left Coajumulco early on Friday morning, May 6, to continue on its way to El Zócalo in downtown Mexico City. Los rostros de Benjamín LeBaron y Luis Widmar, asesinados en Chihuahua, se podían observar en una enorme manta y ni que decir de los rostros sonrientes de Bety Cariño y Jiry Jaakkola, defensores de derechos humanos asesinados en San Juan Copala Oaxaca. En cierto sentido, quienes fueron abatidos marcharon con nosotros. Hablamos de sus vidas, escribimos sobre ellos. Los lloramos en ocasiones. 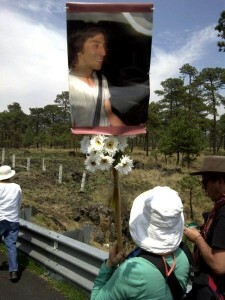 The faces of Benjamin LeBaron and Luis Widmar, killed in Chihuahua, could be seen in a huge blanket and not to mention the smiling faces of Bety Cariño and Jiry Jaakkola, human rights defenders killed in San Juan Copala, Oaxaca. In a way, all those killed marched with us. We talk about their lives, we write about them. We cried about them sometimes. 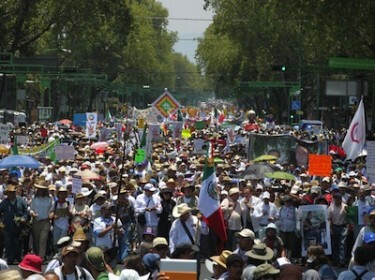 Thousands of Mexicans took part in the National March for peace and justice. Image by Luis Ramon Barron Tinajero, copyright Demotix (08/05/11). This march, more than anything, is a march against impunity. In some cases, police kidnapped and disappeared the victims. In another case, organized crime snatches little girls from a community and traffics them. In other cases, victims were killed in armed robberies. The perpetrators vary: organized crime, unorganized crime, or the government. Supporters of #marchanacional gave a simple answer: they don’t represent us. Twitter users quickly reported all of these accounts and at least one was suspended for spam. Es sensible a los ciudadanos y a su exigencia de tener un México sin violencia, por lo que las acciones de las fuerzas de seguridad están encaminadas a proteger a los ciudadanos y lograr el objetivo de tener un México de paz y justicia. [The government] is sensitive to the citizens and their demand for a Mexico without violence, because the actions of the security forces are directed to protect citizens and achieve the goal of having a Mexico of peace and justice. A migrants’ caravan of 60 persons en route to join the March for Peace with Justice and Dignity was attacked by three armed assailants who tried unsuccessfully to kidnap a woman in the group. The attack took place at 1:30 this afternoon, near the border of the municipalities of Orizaba and Rio Blanco in the state of Veracruz. The Immigrant Caravan got to Puebla safely and joined the #marchanacional caravan in the National University in Mexico City on Saturday. Before we can begin to care about the impact of American drug consumption and U.S. drug policy on the tens of thousands of Mexicans dead, we have to feel… that Mexican problems are American problems.